Our last morning and we still had yet to hear about an appointment that may or may not be happening away to the south. We breakfast quickly and head out to Châteauneuf for the last time. The wind has subsided somewhat, but the chill lingers. Thierry Usseglio of the Domaine Pierre Usseglio gives one immediate confidence. His "cellars" are utterly spotless: a good sign. And he is loquacious when it comes to his wines, the wines of Châteauneuf in general and how they shoud be made. Perhaps it is that he considers himself to be something of an educator. In the winery stand glass jars full of earth that illustrate clearly all the major soil types of the appellation and he refers often to a map of the local vineyards; a chart into which has been stuck coloured pins that reveal exactly where the domaine's vines are planted. This is a very serious source of Châteauneuf. 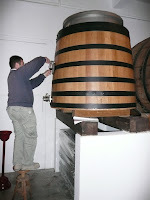 We taste the 2006s and then repaair next door for a sampling session of some of the barrels from which his cuvées of 2007 will come. For those who eschew high alcohol hooch, this could be a source to avoid. But those who are happy that alcohol is a part of any wine - and that as long as that alcohol is in balance with the other constituent parts, its level is largely irrelevant - this is a source to follow. The quality is very high indeed and M Usseglio has a deep-rooted understanding of how to get the best from his antique vineyards. So, all-in-all this has been a very fine buying trip. We have struggled in vain to find duff wines; there simply was not a bad example among what we tasted. The one problem is that of those alcohol levels. We tasted cuvées of 17.5%abv during our week away. We also tasted a great many red wines with residual sugar. A part of the problem is that recent droughts cause the tannins and other polyphenols in the skins of the grapes to cease ripening, whilst sugars in the juice rise and rise. Phenolic ripeness is paramount; one has to wait until the skins are ripe before picking, regardless of sugar and acidity levels in the juice. This could result in one picking fruit with potential alcohol of 18%abv. Personally, I can sympathise with those crusaders who are demanding lower alcohol in wine. I don't want to be forced into a choice between 15%+ or Mosel Riesling when I open a bottle of wine. However, there are some wines that wear their alcohol with class and a complete lack of cynicism and Châteauneuf certainly falls into this category. Having finished up with Thierry, we head south towards Marseilles debating where we are to hove to for lunch. Carry-le-Rouet gets our vote and we find a restaurant over the marina where we spend a relaxed lunch eating none-too-fresh seafood and drinking a bottle of Bandol rosé. After a week of perfect wines, we can forgive a sweaty prawn or two.